It’s a happy day here at Martingale—we have a budding quilter on our staff! Our marketing graphic designer, Tara, is testing the quiltmaking waters, and she’ll be sharing her experience in a series of blog posts at Stitch This! Today you’ll get to know Tara and see her first sewing efforts. Let’s all cheer her on! As I sit down to write this it’s January 3, 2018—exactly one year to the day that I started working at Martingale as a graphic designer in the marketing department. Me and my office! This quilt was made by Judy Murrah in 1995, and it actually plays London Bridge if you know where to find the button. I’m not kidding. First things first: Martingale is fantastic! Working here is truly inspiring. Everyone here is so creative—I’ve never worked with so many people who make things in their spare time. I distinctly remember using the phrase “wannabe quilter” in my cover letter when I applied for the job, and Karen Johnson, our Director of Marketing, took that 100% seriously. Enter 2018. My resolutions were to be more creative in my spare time and to do some home improvements, including cozy-making. Committing to a series of blog posts seemed like a good way to jump-start those efforts (and impress my boss!). So here we go with my first post about my first quilt! There’s so much fabric out there it makes my head spin. So I decided to start with my tiny stash. I was given a bundle of Kona Cotton Solids as a souvenir from Spring Quilt Market, and it seemed like the perfect opportunity to use them. At our Martingale holiday potluck, I won another awesome bundle of Bonfire Batiks by Moda. I thought they might work well with the solids. Tools of the Trade—OLFA and Pat Sloan to the rescue! Martingale let me borrow a toolbox full of OLFA rulers, cutters, mats, and spare blades. I really like their Frosted Advantage Ruler. It was easy to see what I was doing—very helpful for a beginner. 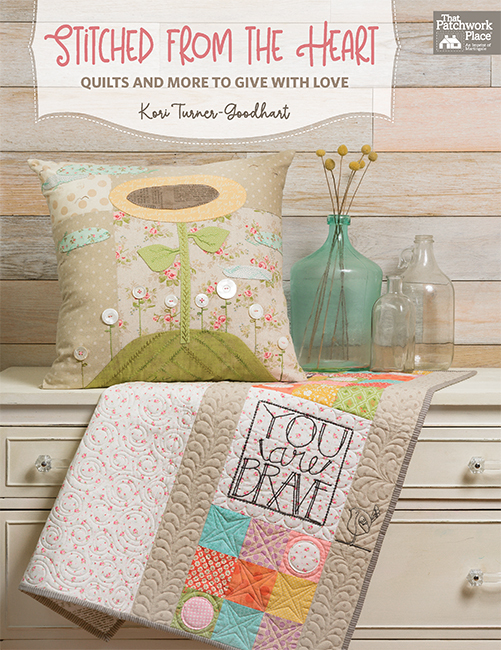 Pat Sloan’s Teach Me to Make My First Quilt seemed like a logical choice, and I was right. Although I didn’t plan to make a project from the book, I knew that Pat’s explanation of techniques would be the perfect prerequisite reading. In the end, I decided to make a little runner for my table at home, sewn out of strips in a rainbow palette. I figured sewing straight lines would be challenging enough! So, do you want to know how it went? Stay tuned for my next post in which I put Pat’s book to the test and end up with a real live finished quilt top! 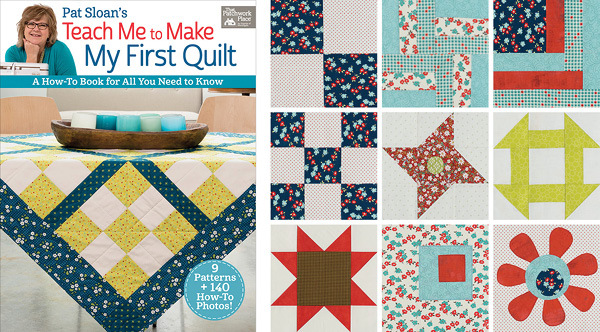 I’d love to know: What was your first quilt project? Describe it in the comments! I did a queen size log cabin (with some help from a friend)! I did it in denim and red fabrics! Love the look of it on the back of my couch. That was about 15 years ago! My Great grandmother was a quilter and I used to watch her, I found it fascinating. So, for my mom’s birthday when I was 5, I cut up my doll blankets and made a little quilt for her. I did the rail fence in red, white and blue colors as a baby quilt size. It came out real nice, and I caught the bug! Made a queen size quilt if an old hoop skirt girl with umbrella with scraps of clothes I made for myself at age 15. I was 5’11″at age 11. So clothes were difficult to find in a teenager. I have been making my own clothes since I was about 10 so I have a large fabric stash. About 20 years ago I saw a photo of a Trip Around The World quilt and decided to give it a try. I had absolutely no quilting experience but the joy of bringing those scraps together into a beautiful quilt got into my blood and I have been quilting ever since!! Every time I make a new quilt, I learn another new technique or short cut! I did a large Thimbleberries quilt in flannel. That was 2001, and all these years it’s still being used and loved everyday by my husband. I’m enjoying your journey and love how you took the two fabric packs and put them together to make a simple but interesting table runner. It looks fantastic! My first quilted item was a pillow sewn completely by hand made for my parents over 30 years ago. It’s been a journey ever since and now I teach quilting at my LQS. Enjoy the journey, I look forward to seeing future projects! My "first quilt" was/were actually two made simultaneously, both paper-pieced. One was "You Can Never Have Too Many Shoes, An Homage to Imelda Marcos" and the other was Australian animals, a reminder of a trip to AUS. My first quilt was a log cabin too – a baby quilt for someone special. My hand-me-down sewing machine and I did not get along, and my family asked me to never sew again! Fast forward about 15 years to a "new" hand-me-down sewing machine that didn’t fight me every step of the way. This time, I took a beginners’ class at my LQS to get started properly, and I’ve been happily, busily sewing for 10 years! My first quilt was a jellyroll race with a jellyroll nobody wanted. That was 3 years ago and I haven’t stopped! That looks like a Bargello could be happening. I hope they warned you that quilting is addictive! My very first rotary cut quilt was a queen size rail fence wedding quilt for my son. It was meant to be a one off. Prior to that in the 70’s I had puttered at quilting not knowing how. My very first quilting project was a Trip Around The World quilt – I’d seen one in a book and thought that it looked easy enough to do. I bought a PILE of poly-cotton fabric in a rainbow of colours, and cut each colour individually (I did have a rotary cutter)… one 2.5″ red square for the center, 4 light blue blocks for the next round, and so on until I had enough blocks for a double-bed sized quilt. Do you know how much fun it is to make a BIG quilt, sewing one small square to another, press, repeat? Keep doing that until you have a row done – and then you do the next row… and don’t mix up the order of the colours! That was 15 years ago. I’ve learned a lot about strip piecing and all the other quilting tricks since then. My first project, was, like yours, something with just straight lines. I had done a single quilt block for a friend, but it was a block that is set on point, and the triangles drove me batty. So for my first real project I picked out a jelly roll pattern and a jelly roll, figuring it would be the easiest thing to make. I only had a small mat and rotary cutter, so having the strips already cut was key. I made a log cabin quilt, set in a star pattern, and the lady at the quilt shop was not encouraging (I was sewing by hand back then), but it turned out pretty darn good. Unfortunately, by the time I got back to show the not-encouraging-lady at the quilt shop, she no longer worked there…..never got to prove to her how wrong she was about a beginner quilter not being able to handle a log cabin quilt! Oh you’re hooked! My first quilt was a baby quilt for my second daughter. Someone gave me an appliqued quilt for my first girl. I loved it so much that I decided that I had to make a quilt for my second baby. It was 1979 and Quilting had made a resurgence in pop culture. I found a book, scrap quilts, at a discount book store. I sort of followed the directions. It used templates! Instead I used my 12” plastic ruler to draw lines on my fabric and cut shapes out with scissors. I made six bear paw blocks, and sashed them. I quilted it on my sewing machine, reducing the pressure foot pressure. And just turned the edges inside the quilt instead of binding. Sorry such a long comment, but it was a quilt from the “olden days”! A lot cabin wallhanging,it’s still my favorite pattern. It was strip piecing and no measuring. I finished it with some hand quilting. The year was 1990. It got me hooked on quilting! My very first project was hand stitched, cut with scissors, limit on fabric choice, calicos, hand quilted, and was a 16 inch pillow. I did finish it. I thought I did a great job. I was happy and ready to start on more quilting projects. It is a lap quilt in blue and gold in a very simple layout. It was made in a beginning quilting class at a LQS near where we lived. It is 14 years old. Oh my goodness! I had a real time just picking 1 pattern to start with. It was 1972 and there was no computer yet! No internet to pick patterns from. Imagine that! I found a book at the library by Ruby McKim called "101 Patchwork Patterns". I am sure I looked through that book every night before falling asleep for a year. I could not seem to make up my mind which one to make! I finally made a decision by saying "My name is Susan so I will make Susannah!" No kidding, that is exactly what I did! I picked muslin and the colors were flowers tiny pastel prints. My off blocks were baby blue gingham. My quilting design in the gingham was a spider web in navy thread. What an ugly quilt (I say now a days!). Back then I was really proud of it and promptly started a dresden plate with multi colored scraps which is still a showpiece. I got tired of the baby prints! So I had 2 quilts finished before I was 18! Wow. My first quilt project was a double bed quilt. Can’t remember the pattern name. Second one was Storm at Sea. Now I look at it and wonder how I had the nerve to do that! I guess one step at a time is the only way to go. Then it is not so intimidating! Many years ago I wanted to learn more about quilting. 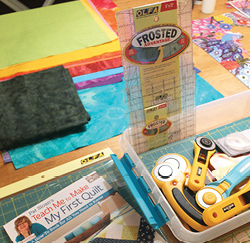 I sewed clothes for myself and my daughters, but quilting seemed something I had to research. I got a quilting book out of the library and began to read it. 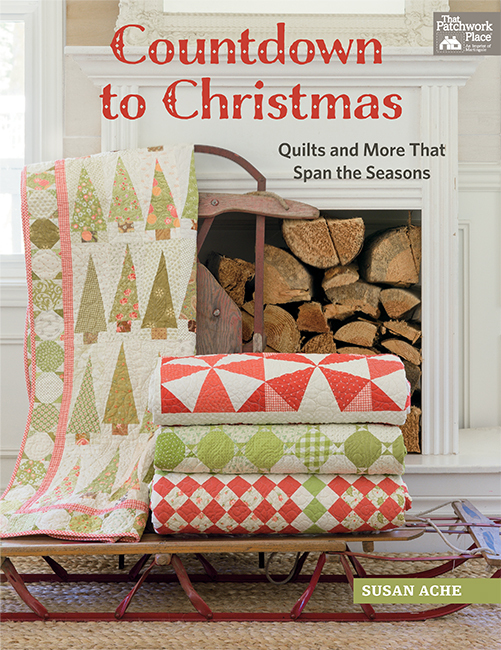 Up to this point, I had subscribed to quilting magazines and read them from cover to cover. Now with this book, I could follow the instructions visually and create. I love the feel of fabric. When I decided on the colors, I would fondle and caress the cotton to make it my own. I made my first quilt using the pattern "Ohio Star." To me it’s absolutely beautiful. I still have it. I’ve made other quilts and quilt hangings but that first quilt resonates the ability of a novice quilter to jump right in and begin to cut, stitch and create. My first quilt was a Raggedy Andy theme…it was red and white checked with plain white pieces too. There was a Raggedy Andy one sided doll applique in the center. This was made in the late 60’s and was used by 3 of my 5 kids as little babies. I recently gave it away to a friend who has a Raggedy Ann and Andy themed room…no more kids here. I felt very accomplished and proud. I also at that time made a stained glass pot holder…never wanted to try that again…wayyyyyy to much work. A full size bedspread quilt complete with drops from a Family Circle or Woman’s Day magazine. I still have it!! Oh, did I mention that was in 1978 I laid it out in the floor 8 months pregnant? Won’t bore you with that story. Just wanted to let you know that I was delighted to see you sewing "short" strips. I taught my beginners to not deal with joining 40″ strips. Cutting them in half led to much more success. One advantage of fat quarters. Keep up the good work! My first quilting project was a template based hand stitched block that is still sitting in a box and not completed all these years later (30+). My first completed project was a log cabin with blocks sewn on my machine. That log cabin taught me two things: I don’t like hand quilting (which started my appreciation and use of talented long arm quilters) and that if I don’t like a colour in a block when putting it together then don’t use it (try a block but if I don’t like it, don’t use it). My philosophy is try new things but do what you like and have fun! Enjoy the quilting process. Remember just baby steps and your house will soon be over run by beautiful fabric. I have been sewing for over 50 years and have enjoyed all those years. My first quilt was a sampler booklet I picked up at the craft store. It contained 9 different quilt blocks to get you started and it definitely got me hooked by the time I finished it. That was 28 yrs ago. My first quilt was a baby quilt, an hour glass, which I quilted myself with a decorative stitch. It had a very colorful umbrella design and colors to match. I made about 3 or 4 baby quilts for my growing family of grandchildren before I ever took a class. Now it’s at least 10 years later, countless finished quilts, quite a few UFOs and a list of projects that is endless … but enjoying every minute of it. Always glad to see a newbie enjoying the craft. First project – a charity quilt for our local NICU. Just squares, but I was a nervous wreck by the time I finished. My first quilt project was actually a wall-haning. My friend had taken a class and we were going to moving out of town soon. She insisted I come over to her house and learn how to quilt before we left. The wall handing was a simple 4 patch and I borrowed some green fabric from someone else’s stash! I didn’t even know what a stash was then. I was so happy I had learned how to do this. I had made clothing and crafty items, but had never quilted. I moved into our new home and a week later I ordered a rotary cutter and cutting mat from Nancy’s Notions and have quilted ever since. I can’t imagine my life without quilting!! 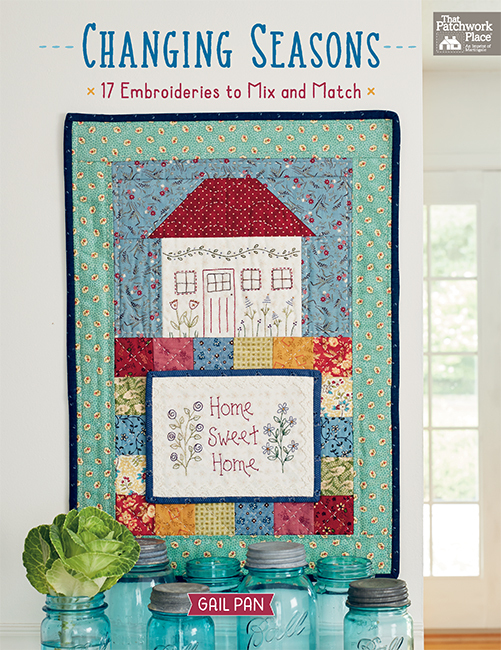 A sampler – the group of us who took that class turned into our present-day Quilt Guild. Our teacher had learned from her Mother-in-law who, with her friends & neighbours did hand quilting. The ‘new’ guild – the next generation – is almost totally machine quilters, two of which have long-arms. Quilting is always evolving!! Had all the equipment, but did not use quality fabric. Bought the fabric on a whim. So the top has been done for years, but I never finished the rest. I’m not in love with it, but it turned out well for a first project. My first quilt was an improvised stacked coins design, which I made for my oldest daughter’s baby quilt. My first finished "quilt" was a Jacob’s Ladder table runner. I still have it and love it! Tara, How wonderful that you “wanna be a quilter “ and you already are! Keep this art alive You’re on creative path w / Pat Sloan as your introduction. Oh my first quilt was called 5 easy pieces. Something one of my Aunties (mentors) shared with me. I’d love to hear that quilt in your office play London Bridge -how cool! My first quilt was a sampler quilt. I took a class at In The Beginning and was hooked! It was a large quilt for a crib, which could cover the top of a twin bed from the pillow down. Basically 45 x 60 of a large sunbonnet Sue with hearts in the four corners. Made for my oldest daughter’s bed at that time. I heard people talk about making quilts. Back then quilts were just giant pieces of fabric or even new bed sheets stretched tightly onto a quilting frame with batt and backing fabric which were tied together with yarn. They were serviceable but far from the marvelous quilts we make today. My first quilt was make from denim scraps and backed with velour. It weighed a ton but was great for camping. I was a child when I made my first quilt with my Grandmother. I think it was a 9 patch but that was a very long time ago. My very first quilt top was a mini four patch for my daughters doll.Mostly because I didn’t have the confidence to make a large one after working in my family’s quilt shop and seeing all the gorgeous ones coming in the store by local quilters and reading about the tradition of quilt making in anything I could get my hands on…the bug was that strong! But not my confidence level. With encouragement from my mother in law, who said, “there’s and entire store at your finger tips girl, make anything you want!” I made small jumps and years later enjoy making mystery quilt alongs the most,because isn’t every quilt a mystery until we finish? Good luck Tara and congratulations on taking your jump into the most rewarding thing I ever chose to try! How smart to start with a table topper! Too bad I wasn’t that smart. Lol. My first quilt was a full size bed quilt. I had sewn since I was 13 making many of my own clothes so sewing a straight line wasn’t a problem. And I did actually complete the quilt (in a reasonable amount of time). It still hangs on my quilt rack in the fall. So glad Martingale has made a quilter out of you! Ahh, we all start with that same notion, "I’ll just try this one project to see if I like this quilting thing….". I did some 16 years and many, many quilts ago! My first was a four block Ribbon Star wallhanging that was demo’d by Marianne Fons on Simply Quilts (the episode was appropriately called "Quilting 101″). I just recently got to revisit that memory when I put some of the scraps from that quilt into my latest project. 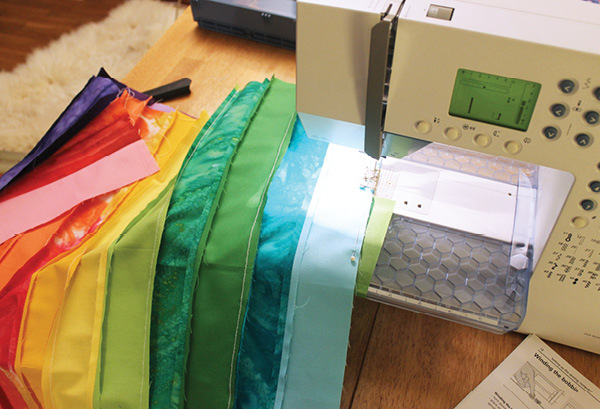 Lesson: don’t discard your fabric scraps — they can be used to make new memories long after that first project! My first quilt was a little advanced for someone with no experience in quilt making. It was a star turned into single wedding ring….Off center, wonky and crazy,but my husband claimed it right from the start. I started sewing as a child. Our mother made a lot of our clothing. Made my first dress in Girl Scouts. Made clothing for my children when they were young. When I married I started making my own curtains and drapes. Then I started doing counted cross stitch pictires of quilts. We went to car show in Vermont and at one of the mills turned into stores there was a quilt shop. I was hooked. I said I can do that. I started with log cabin pot holders. That was it. It took me a while to realize that you, at times, have to buy more then one yard pieces. That happened when I made one of my first quilts and I didn’t have enough fabric all the same for a backing. Experience is such a great teacher. I baby sat for my Grandchildren for many! years … they can all sew … I wasn’t not going to sew, so they sat on my lap and eventually as they grew, they to started to sew. Some ended up making simple quilts in Brownies and Girl Scouts. Just the fact that they can all do it is thrilling to me. My first quilt project was Eleanor Burn’s Log Cabin Quilt in a Day. I went home at the end of the class and kept sewing well into the night. I was hooked! My "three" first quilts were; a puff baby quilt, then a log cabin quilt, and then a rail fence quilt which is hanging in my sewing room. It’s the best hobby in the world|!!! My first quilt was a sampler quilt. I took a class at my LAS and we used Alex Anderson’s beginning quilting book. I learned a lot and was hooked. I have so much fabric and patterns now! Although I had made my own clothing for many years, I decided I’d branch out into Quilting. My first project was a hand quilt-as-you-go Log Cabin, double bed size! Carried it around with me working on one block at a time. Didn’t have a pattern, just made it up as I went along! It has an extra log on one side. Little did I know! I entered it in a quilt show and when I saw it hanging … I was hooked. I call it "Log Cabin Variation". Now, almost 50 years later, I’m a fabric/fiber artist and still quilting! I use my electric needle, no more hand sewing. When I was 10 yrs old my grandmother helped me make a quilt top out of hexagons, I think it is called grandmothers garden. I put a backing on it by sewing around the edge, it was used for all our dolls. I have not idea what happened to it. Fast forward over 50 years. I started quilting by making a sampler quilt at a sewing store near me. Had someone quilt it on a long arm. I was hooked, started making quilts and quilting them on my domestic machine. I love fabric and making quilts. My first quilt was a bed sized Trip Around the World (complete with a polyester sheet for a back- never again), after completing it, I decided to take my first Beginning to Quilt class which was taught as a Sampler quilt. May you have many happy quilt projects ahead. I wanted a new queen size bedspread for the guest room. I had lots of hands on knowledge of the sewing machine, but no quilting experience. I bought a "Trip Around The World" pattern and some coordinating fabrics I liked and started in. It turned out great, but now how to make it stick together? I birthed it and tied it. I was pleased with myself, so I joined a Quilt Guild and came down with the quilt bug and still have it today. My first quilt was a log cabin. As I was trying to figure out how, my husband stepped in to show me how! When he was six, he was recuperating from meningitis. He had to relearn walking and hand-eye coordination. Since his mother was a quilter, she used this to teach him. She had him help her cut out over 8000 pieces to make a grandmother’s flower garden, which then won Best in Show at the Wisconsin state fair. He still has the quilt he hand-sewed. He appreciates my efforts. My first quilt was a hot mess for sure. Part broidery perse, part domestic machine quilted, part hand quilted, part pieced, part hand appliqued. It was done on black with a white poly batting. I could not have made more mistakes, but it is still on the back of my sofa, it started a long friendship with fabric. I have gone on to hold offices in my guild and teach many newbies to quilt. I could not have found a better friend than my quilts and the friends I have made that way. You’re smart to start with a small project that left you wanting more. Not knowing any better, I started with a king size rail fence. The piecing was easy, but- then I had my mother and mother-in-law help me tack it. BIG project. It was on our bed for many years— until I was sick of it. Rust and navy are no longer my colors. My first quilted project was when I was about 12 years old. I made a 9-patch pillow from gingham and denim, then I made x’s and o’s and used the pillow as a tic-tac-toe board. I had sewn clothing for years and shortly before I retired I decided I needed to learn to quilt. My first project was a block-a-month quilt from a LQS. I had a mistake in one of the blocks I discovered as I was going to put it together and it took me 15 or more years to go back and fix it and finish the quilt – but I won’t part with it. I have made numerous quilts since starting and still enjoy doing so for family and charity. I had sewn clothing etc. since I was a child but decided to learn to quilt prior to my retirement so I joined a block-a-month sampler group at the LQS. As I got ready to put the blocks together I noticed an error in one of the blocks so I laid it aside to work on the other quilts I had already started. It took about 15 years for me to go back and finish that quilt but I love it and won’t part with it. I completed 16 quilts in 2017 and 9 of those were for the chemo kids in a local hospital. Sorry about the length. Thought I had lost the first paragraph and rewrote. My first quilt was made with a horse panel. My sweet granddaughter who loved horses at the time saw it in Hancock’s fabric store and begged, please make it for me granma. How could I refuse! That’s what started it all! I have been quilting ever since, about 16 years now. It’s such a big part of my life, really my passion. So fun and rewarding to make gifts for all of my family. I love reading these comments, brings back many memories of my quilting and sewing history! I seriously can’t remember the exact first quilt I made, it’s been way too many years, OMG over 50 years now! And although I have done many crafts over the years, sewing and quilting is by far my favorite. Watch out, Tara, it’s joyously addictive! A pieced pillow in high school. In bright orange, still a favorite color of mine! So long ago. So glad you decided to join the club! It’s the best obsession you’ll ever love. My very first attempt was a mishmash of polyester voile, Indianhead cotton, and printed denim. Still have the pieces. Then a friend invited me to her quilt group. Each member made several blocks for a designated quilter, who then arranged them into a top which everyone gathered around to hand quilt. We were still using templates made from cardboard back then. My choice was a Flying Dutchman in muslin and calico with navy and muslin borders. So many Flying Geese blocks! I still have it. Since then, I have made many tops, hand-quilted quilts, and I’m learning to machine quilt. The process never ends and I enjoy every part of it! What a gift for you to be surrounded by such inspiration! 2 tablerunners out of the same pattern….one for fall and the other for winter. My first quilt was a very simple baby quilt, then a wall hanging, another baby quilt, then a lg. throw sized flannel, Log Cabin quilt. Since then I’ve made several twin, to Queen sized, pieced quilts. My goal now is to make a bed- sized quilt for each of my daughters, grandchildren, greatgrandchildren, and my two sisters. I fell in love with quilting as a young mother, desiring to make a sweet baby quilt for my baby daughter. That was in 1975, and I’ve never looked back! I won’t live long enough to make all the beautiful quilts I want to, or to use up all my stash! Quilting is my sanity, my fun, and my creativity. I hope to die sitting at my sewing machine, when the time comes! I joined a group at our church being led by a couple of great quilters. I made the first class and we would be meeting two weeks later to continue. I knew I couldn’t make the next class and if I had to wait a month – it probably wouldn’t happen. I found the pattern book that the ladies were using and finished the quilt on my own. The only sewing I did prior to complete my quilt was for the "Stockings for Soldiers" that my mom showed me how to make. The quilt (lap size) was Eleanor Burns’ Double Irish Chain – which I surprised my mom with for Mother’s day that year. I’ve been sewing/piecing quilts now for 6 years and am HOOKED. Sewing came into my life at the perfect time and truly is my therapy – and opened up a creativity I never knew (until age 53) that I had!! !